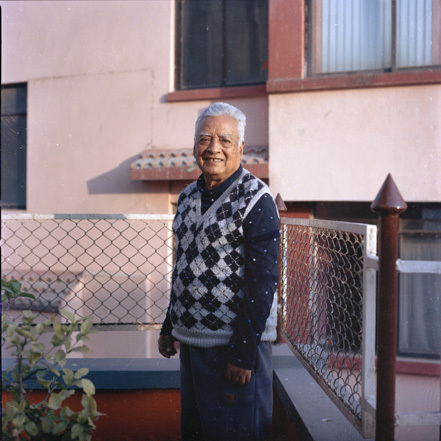 Shridhar Lal Manandhar, born in 1940 in Dugambahil, Kathmandu, is and has always been an inspiration to a whole generation of younger photographers. His photography ranges from commercial, to nature and landscape, to journalistic, all equally influential. In the 1970s, he travelled to Lomanthang with a friend, and later to Everest Base Camp alone where he photographed landscapes. The American Embassy began assigning him to shoot cultural and diplomatic events. His clients included popular hotels such as Phulbari, Yak and Yeti, and Hotel Annapurna along with numerous travel agencies. In the 1980s, he freelanced for United Press International, worked as an in-house photographer for Nepal Travel Magazine, and contributed photographs to Swatantra Bishwo Magazine. His photograph of late king Birendra’s coronation in 1975 was published in newspapers and magazines all over the world. He was the one of the first Nepali photographers whose work was featured in international media.